Ahh, the news release. It’s one of the fundamental tools of the public relations industry. Unfortunately, it is also often one of the most abused. With its streamlined format and detail-packed text, it can be the perfect way to quickly and efficiently disseminate the who, what, where, when, why, how. 1. Why? This should be the very first question you ask yourself. Do you have a big event approaching? Is your company releasing a new product? Are you being honored with a major award? If you find yourself struggling to answer this question, you might not need a release. Simply wanting to be in the news is not a good enough case. Use this as a chance to understand what types of announcements lend themselves to successful media pitching and stay on the lookout for future opportunities. 2. What? If you distribute a press release, what type of results do you want? Are you looking to increase awareness? Or, perhaps you want to boost sales? Whatever it is, you need to have a clear answer to this question. Establish your objectives, make sure they are realistic and then ask yourself if a news release will help you reach them. 3. Who’s your audience? So you’ve answered the why and you’ve answered the what, now let’s think about the who. Who is your target audience? Who are you trying to reach with this media release? Thinking about which publics will be reading your release can significantly change its text. Writing for investors is different than writing for families with young children. Establish who your audience is and how you will reflect this in your announcement. 4. Who’s your media contact? If you’ve made it to the point where you think you’re ready to write a news release, there is one more very important question to ask: Who is your media contact? Have you decided on a point person that will field all media inquires or requests for more information? Is this person well versed in the history and messaging of your company and prepared to thoughtfully answer questions? Picking the correct media contact is an important task not to overlook. With reporters on ever tightening schedules, responding to the media should be timely and informative. 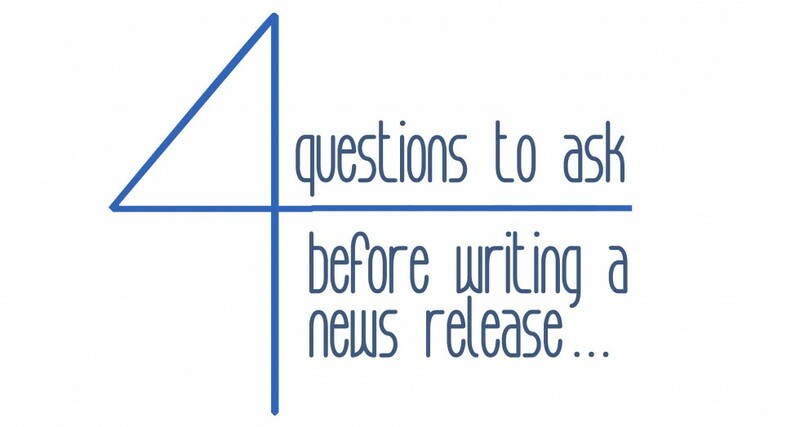 After reading this list do you think you are more prepared to write a press release (or to not write a press release)? If you’re feeling overwhelmed, an experienced PR agency may be just what you need to help you through the process. Let us know if you have any questions!